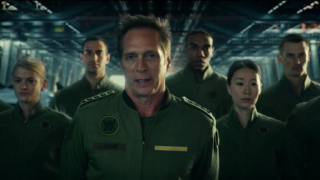 I like the vibe Independence Day: Resurgence is going for here, even if it does call to mind the more exaggerated propaganda from something like Starship Troopers (another sci-fi war movie and thing you must watch). I gotta say though, "united we survive" is not nearly as catchy to me as "service guarantees citizenship." Regardless of who said it better, we'll get to see plenty of stuff blow up when Independence Day: Resurgence hits theaters next month. Directed by Roland Emmerich and starring Jeff Goldblum, Bill Pullman, Judd Hirsch, Vivica A. Fox, Brent Spiner, Liam Hemsworth, Charlotte Gainsbourg, Jessie Usher, Maika Monroe, and Sela Ward, Independence Day: Resurgence opens in UK cinemas on June 23, 2016 before hitting US theaters a day later.